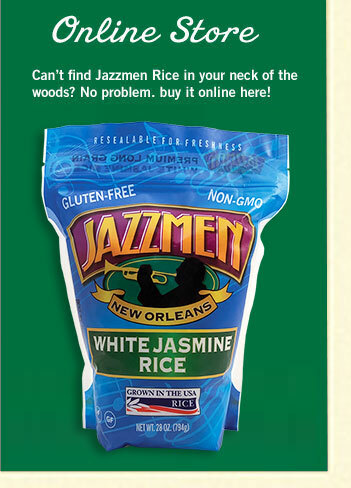 "Jazzman" is a variety of exclusively designed aromatic rice developed by the LSU AgCenter. And, in the spirit of the LSU system's calling - Jazzman Rice is being grown and harvested using Louisiana's finest farmers and agriculture. LSU AgCenter Regional Director/Senior Rice Breeder recently said: "We are totally excited about our relationship with Jazzmen Rice, LLC. Since 2010, we have worked closely with South Louisiana's seed, farming and milling community to conscientiously build a relationship that should help transport our first Jazzman harvest into the retail marketplace in a most professional and timely manner." JAZZMEN AROMATIC BROWN RICE IS EAT FIT NOLA APPROVED! We are proud to partner with Ochsner Eat Fit NOLA, a program that is encouraging health conscious options at restaurants and grocery stores. The Ochsner Eat Fit seal highlights these better-for-you items right on the menu. Look for the Ochsner Eat Fit seal to find nutritious, delicious meals and products designed for those who want to incorporate clean eats into their lifestyle. We sure love to eat here in New Orleans, but this progressive movement is helping us to identify all of the healthy options Louisiana has to offer. Visit Ochsner Eat Fit’s website for more information about the program and Enjoy Jazzmen Aromatic Rice … It’s Music for your Mouth! © Copyright 2017 Jazzmen Rice - All Rights Reserved • © Copyright 2017 Louis Armstrong Educational Foundation, Inc.• Web Design: Scott Ott Creative, Inc. Photography by Bruce France and Matthew Noel.